I’ve spoken to some groups of teachers this year about India and Hinduism. Many of them were traveling for the first time to the country, and they had varying levels of background knowledge about the religion. With 20 minutes to introduce Hinduism (I know…there were other ideas to introduce as well, such as India (! )), I tried this approach: to understand Hinduism, we need to understand both yes and no. The yes is Nehru’s comment. It speaks to a wildly multivocal tradition that also attempts to see unity amidst diversity. It speaks to vernacular versions of the great epics (see Richman’s Many Ramayanas), to regional gods and goddesses, to local shrines that involve little more than a feature of the natural world adorned with kumkum powder. All these features, at the village, regional, and national level, are all a part of Hinduism in a very real sense. The no presents a similar understanding, but from a different perspective. Unlike many other religions, there is no founder of Hinduism, no one single sacred text, no single God or pantheon that is universally accepted. There are of course founders of schools and religious orders; there are of course sacred texts for these traditions, as well as texts (such as the Mahabharata and the Ramayana) that are held in near-universal esteem; there are of course many, many Gods. But all of this is contested – there is no one thing Hindus believe, no one way that they act and approach things. This is true for all religious traditions, but it seems to be especially the case for Hinduism. Thankfully, in my classroom, I have more than 20 minutes on Hinduism. I can spend up to a week introducing major ideas and themes before moving on to our study of texts. In years past, that has meant the Bhagavad Gita and Murthy’s Samskara; this year we will read R.K. Narayan’s Ramayana and only selections of the Gita. (I’m keeping Samskara this year but am looking for something new; I’d welcome suggestions.) But the problem still remains: what is Hinduism, and how should it be introduced? This year, I’m focusing on a different progression of articles and readings, drawing on an approach from Religious Literacy Project at Harvard Divinity School. They have emphasized a novel way of approaching religious traditions, using the following categories: Being Human; Beyond the Human; Practices and Disciplines; Sources of Authority; Religion and Contemporary Concerns. This approach seems very promising, and I think it will help me better introduce Hinduism to my students. What does it mean to be a human being? This is always a valuable question to explore in Humanities courses, and the answer is especially challenging in Hinduism. A human being is someone with a body and a soul (atman). The body is defined in terms of gender and caste, both of which inform ideas of purity and impurity. Human life is also understood in terms of dharma, which I’ve explored elsewhere on this blog. Diana Eck’s “The Deity” has valuable insights about the Hindu pantheon. (This can be found in Hawley and Narayanan’s great Life of Hinduism.) This reading, combined with a PowerPoint about some Hindu gods and goddesses, should put us in pretty good shape for an introduction to what is beyond the human. 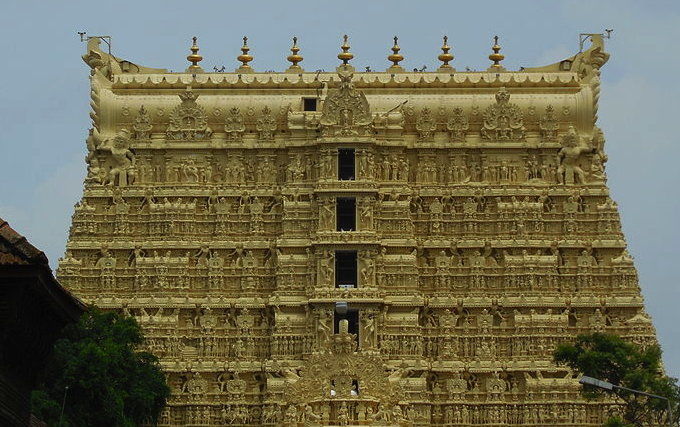 I’ll be teaching a new article this term, and one I’m excited about: Jake Halpern’s New Yorker article about the Padmanabhaswamy Temple in Kerala. This article (edit: it’s behind a paywall; you can find it here) will help us understand temple culture and worship in India, and will also remind us of the fact that we are not just studying the fossilized remains of a once-vibrant religion. The questions we are asking are real ones, and they have real consequences for millions of Hindus around the world. Excerpts from the Gita will also help us understand practices and disciplines, specifically yoga. This will be one of the areas where students will have some background knowledge, and some of it will be correct. If I can come up with a valuable lesson that works with this background knowledge, I’ll post it. Then we’ll get into the Ramayana, one of the great stories of world literature, and a source of authority about dharma throughout south and southeast Asia. The text has long had influence in traditionally Buddhist countries such as Thailand and was translated into Tibetan as early as the 8th Century (a version of it was found in the Dun-Huang caves). The horrific Hindu-Muslim violence in Ayodhya in 1992 was inspired in part by the destruction of Mosque that was built on the supposed site of Rama’s birth – further evidence of the powerful and complex role this text and its ideals play in shaping the world today. 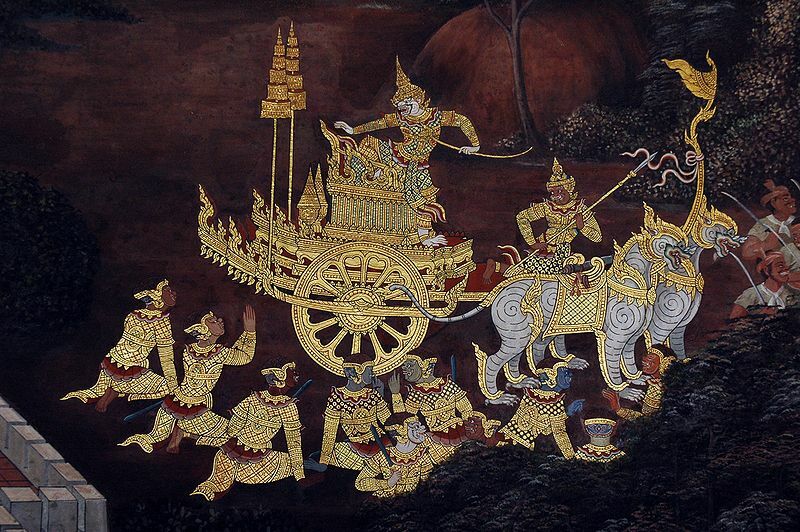 A scene from the Ramakien, a Thai Buddhist epic inspired by the Ramayana. I’m encouraged! We’ll see how this goes. Stay tuned. This entry was posted in Hinduism, Teaching and tagged dharma, Hinduism, Hinduism lesson plan, India, moksha, Padmanabhaswamy Temple, Ramayana, resources, teaching by teachingasianreligions. Bookmark the permalink.